Keeping in line with reviving Gen 4 through its characters and its Pokemon, it should likely come as no surprise that Glaceon showed up alongside Leafeon for the Eeveelutions. Perhaps it’s just surprising that she landed so highly on the list. Glaceon-GX is a Stage 1 Water Pokemon, 200 HP, with a Metal Weakness, no Resistance, and a Retreat Cost of 2! Her Ability Freezing Gaze is a pretty powerful one, shutting down the Abilities of all of your opponent’s EX/GX in play, in their hand, and in their discard pile, with the exception of Freezing Gaze if they’re running Glaceon-GX too. Right off the bat, this beats out Dawn Wings Necrozma-GX, Tapu Lele-GX, Volcanion-EX, Gardevoir-GX, Decidueye-GX – the list goes on and on for sure, making Glaceon-GX already a powerful Pokemon. Just remember it won’t shut down regular Pokemon’s Abilities and that it only works as long as Glaceon-GX is Active. Frost Bullet is the favored Dark Spear variant, at 3-for-90 with a snipe for 30. It’s been popular since Darkrai-EX (DEX), and it’s something Glaceon-GX has in common with Umbreon-GX – right down to the “bullet” in the name. It’s a solid attack too, able to 2HKO the small EX/GX while also threatening a set-up on other Pokemon in the back or even an extra KO if the opponent isn’t careful. Coupled with Polar Spear GX, which does 50 damage for every damage counter already on the Pokemon, and you’ve got a devastating combination to deal with! Water decks have a lot of perks right now in Standard – Manaphy-EX (BKP) provides free Retreat, Aqua Patch (GRI) gives great acceleration, and Cyrus <Prism> is useful against Bench-heavy decks! It gives Glaceon-GX a lot to work with, and that’s all she’s gonna need – cause as far as powerful Pokemon go, she’s one of the best! Arora Notealus: Glaceon-GX is definitely a front runner coming out of this set as a new deck – alongside a couple other noteworthy contenders – and she’s likely to see a fair bit of competition in her time in Standard. It’s going to be quite a ride for Water decks, and Glaceon-GX is likely to be the most played Eeveelution-GX to date! Next Time: And the #1 spot on the list is taken by the #1 Trainer in Sinnoh! Ultra Prism brings two more Eeveelutions, but the one we’re looking at today is…Glaceon GX! This is one of the most anticipated cards in the set because she has features to work with. 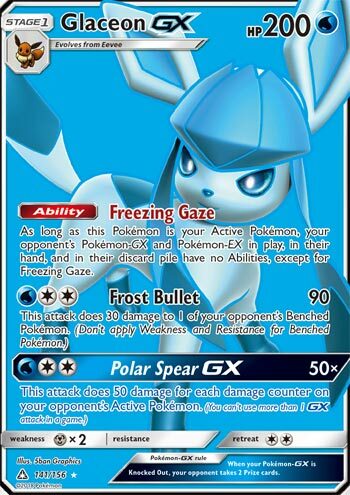 Glaceon GX has an ability called Freezing Gaze, which shuts down abilities of your opponent’s EX and GX Pokemon. EX and GX Pokemon are still played to some or most degree and shutting down their abilities hurts…..a lot. Volcanion-EX cannot use Steam Up for dealing more damage; Keldeo-EX cannot pivot without Rush In; Kartana-GX cannot whack off special energies; Zoroark GX cannot draw more cards; and it goes on. However, non EX/GX Pokemon can still freely use their abilities such as Greninja BREAK, Zoroark Stand In, and Garbodor (though shutting down all abilities is just as bad as Glaceon’s). Frost Bullet is a cool looking attack name that costs WCC and does 90 damage to the Active and 30 damage to one of your opponent’s Benched Pokemon. Looks like we got another Night Spear variant of that attack. And then we get to Polar Spear GX, which also costs WCC, and it does 50 damage times the number of damage counters on the Defending Pokemon. It won’t do any damage if the Defending Pokemon has no damage. 1 damage counter would be 60 total (10+50); 2 damage counters would be 120 total, and so forth….it’ll take 4 damage counters and a bit of Kukui/Choice Band to OHKO any Pokemon in the game. I find the GX attack a little lacking, as it’s meant to be a finisher, but not something you can use early on because there’s not much damage in the first place. Unlike Leafeon GX, the Glaceon user would love to go first in the game, so that the all-mighty Eevee can evolve right away with Energy Evolution, turn it into Glaceon GX and shutting down certain abilities. She can also fuel up attacks with Aqua Patch so that Frost Bullet can start to contribute damage. A lock can be scary, but due to the wording, Glaceon GX can be played around. She can be switched out for a different Pokemon from your bench, getting rid of the lock. Metal Pokemon can hit for weakness, and there’s a lot of support there in this set. You can’t mitigate the weakness, but you can have just quad Glaceon-GX or just one Glaceon GX in play, and the lock is still on. Like Leafeon-GX and Sylveon-GX, Glaceon is another great Pokemon to start with in the match. Glaceon GX (UP 159) flies into the meta on an arctic cold gust of wind from the Ultra Prism expansion set. And it chills us to the bone with its ability Freezing Gaze, which nullifies any ability on a GX or EX Pokemon. It literally freezes your deck in its tracks. No Lele for Brigette or Cynthia or Sycamore. No Trade. No abilities from GX or EX Pokemon… as long as Glaceon is in the active. Great! So you’ll just play Guzma and move it back to the bench. Unfortunately, if you play Guzma, you won’t be playing a Supporter for the turn. Moreover, chances are you’ll be bringing a feature attacker into the active position. I’ve seen Glaceon paired with Zoroark GX, Ninetales GX, and Decidueye GX, all of which would be more than happy to slug whatever Pokemon the back end of your Guzma plants into the active. Fortunately, Glaceon’s two attacks are somewhat underpowered. Frost Bullet does 90 damage to the active and 30 to the bench (and costs a Water and two colorless energy – wow three attachments and only doing 90 to the active… ouch! ), and then the GX attack Polar Spear is a 50X magnifier, but that’s a little disappointing in that if the defending Pokemon only has 30 damage on it from a previous Frost Bullet, then Polar Spear only does 150. It’s not great, but that means if you’re spearing a Pokemon you already donked once with Frost Bullet, that would put a total of 180 damage on that Pokemon, which is enough to KO most Basic EX and GX Pokemon. Attach a Choice Band, and you KO most Stage 1’s as well. I tried this with Greninja and went 5 W 6 L, but found that unless I started Glaceon, it basically just became a Greninja centered deck, and I frequently didn’t even bother to get a Glaceon out. I will say that duo is a good pairing because they have different weaknesses. I feel like Freezing Gaze has affected me more than it affected my opponents when I played it. It seems like you’re relying on your opponent to be running Zoroark GX or Decidueye GX or Volcanion EX. Decks that use Oranguru and Octillery are pretty much nonplussed by this deck, and I know that I annihilated it once with my Alolan Dugtrio deck. I’ve faced it twice and have gone 2 W 2 L. I’ll probably try it more after Collinsville, but this is just another card from UP that I haven’t really been able to get my arms around. I think this card will see significant play in Collinsville. I think it’s a good card, and if I had been able to figure it out and have more success with my Greninja archetype, I’m pretty sure this is the deck I would have taken to Collinsville. Unfortunately, I did not have as much success with it as I would have liked. I’ll probably come back to it next week and retool it and come up with a good deck for Greninja, but as of today Glaceon GX is a pass for me. Just missing the top spot in our countdown, the number two card is Glaceon-GX (SM – Ultra Prism 39/156, 141/156, 159/156). Every Eeveelution automatically gets a boost thanks to Eevee (Sun & Moon 101/149), and Glaceon-GX is no exception. As a Stage 1, Glaceon-GX isn’t too demanding even when you can’t take advantage of that Eevee’s Energy Evolution Ability. As a Pokémon-GX, you’ll have to mind the various effects that punish being one, and never forget you’re giving up an extra Prize when KO’d, but (as we’ll see) Glaceon-GX gets plenty of compensation for this. Being a [W] Type grants access to some great tricks, like Aqua Patch. If the metagame shifts how we expect and your timing is good, it could also be great for exploiting Weakness; this set gave [M] some new toys, but almost all [M] Pokémon are [R] Weak, and almost all [R] Pokémon are [W] Weak. 200 HP doesn’t make it an amazing wall, but it should allow Glaceon-GX to take a hit quite often and keep on fighting. [M] Weakness makes them one of the big exceptions, and also might sour the earlier Type-matching plans I mentioned. Both lack of Resistance and a Retreat Cost of [CC] are typical, but the latter actually matters; it isn’t usually crippling, but paying it tends to add up and fast. Glaceon-GX has the Ability “Freezing Gaze”, and it kind of makes Glaceon-GX into a Pokémon-EX/GX counter; while this Pokémon is Active, you gain a one-sided Ability lock against your opponent’s Pokémon-EX/GX. Most decks are running at least Tapu Lele-GX, with some relying on such Abilities quite heavily. Of course, your opponent is probably using one (maybe their only) Tapu Lele-GX on his or her first turn… but thanks to the earlier referenced Eevee, if you go first, you can still beat them to the punch. Freezing Gaze does nothing to your own Abilities, which means you can get pretty crazy on the combos. Only working while Active keeps it from being obviously broken, and means your opponent may be able to deal with Freezing Gaze by forcing Glaceon-GX from the Active position. Backing up its Ability are “Frost Bullet” and “Polar Spear-GX”, each of which cost [WCC]; if the deck includes Aqua Patch and/or Double Colorless Energy, this is fairly affordable. Frost Bullet does the once format defining, now simply “good” 90/30 damage split between your opponent’s Active and one of his or her Benched Pokémon of your choice. Even with a Choice Band, this is a bit out of OHKO range for the largest targets, but adequate for most things. If you can soften them up with the Bench damage, then even the largest played attackers can fake being 2HKO’s. Polar Spear-GX is one of those context-sensitive GX-attacks, as it does 50 damage times the number of damage counters already on your opponent’s Active Pokémon. This is a good ratio, and it hits some key numbers nicely; 30 damage means another 150 to finish off 180 HP (or smaller) Pokémon, 40 damage to take out anything with less than 240 HP, and 50 to take out almost anything. In all cases, HP buffs, Resistance, or other defensive buffs can spoil it all, but I’m not too worried about those… then again, I’m not too worried about setting up for this attack as it is a one-and-done GX-attack. If you’re already struggling or want to take an early lead, don’t rely on Polar Spear-GX. Glaceon-GX impresses because it could potentially become a near-universal opener. How? While not every deck runs basic Water Energy, most could. A 1-1 or 2-2 line for Glaceon-GX, two to four slots for basic Energy and (maybe) search for said Energy, and it mostly is a matter of getting Eevee to the field and Active on your first turn. Far from a perfectly reliable opener, and too many cards to run even as an unreliable opener for me to comfortably think of Glaceon-GX as TecH, nonetheless it all could be done. When we narrow things down to decks that either already run basic Water Energy or basic Energy searching effects that work T1, and we’ve still got a decent amount of options… and if you do have room, you can combo this with various other Eeveelutions, and tailor it to the metagame. Don’t need early Ability lock? Punish [D], [R], [G], [L], or [P] Weakness (but not all at once unless it’s an Eeveelutions deck). Glaceon-GX is easier to incorporate into Expanded decks, and there are more Pokémon-EX worth affecting here – hello, Shaymin-EX (XY – Roaring Skies 77/108, 106/108) – but there are more counters, as well. In Standard play, Guzma is an obvious answer, but (especially early game) you’re probably counting on Tapu Lele-GX to fetch one from your deck… which Freezing Gaze prevents from happening. In Expanded, Battle Compressor and VS Seeker provide an alternate search plan. Makes a Glaceon-GX/Vileplume (XY – Ancient Origins 3/98) deck sound rather tempting, doesn’t it? For the Limited Format, Glaceon-GX is a champ even if its Ability will probably never matter. Just mind the abundant [M] presence and that you’ve got to get Eevee to the field for a turn before you can Evolve; that is much easier said than done in the Limited Format. Glaceon-GX secured second place by accumulating 86 voting points from all five of our individual lists, with me personally having it as my second place pick.